We manufacture goods with around 80% in house manufacturing capabilities and hence we have been able to maintain good quality over a period of 3 decades. We started in 1985 with manufacturing of wire wound potentiometer to meet the demand of TV booster industry. With time and speed we are manufacturing Single turn single gang and multiple gang Wire wound potentiometer, Magnetic absolute and Incremental encoder, Contactless potentiometer, potentiometer with switch, 4 wire potentiometer, Linear contactless potentiometer and several others. We are continuously adding new products in our portfolio. We work closely with OEMs and customize the product based on customer specific requirement. With our vision to become complete sensor and solution provider to industry we have joint hands with A SWISS BRAND CONTRINEX leading Proximity, Photoelectric and many other sensor manufacturer and A German Company ESCHA leading connector cable, junction boxes and connector manufacturer. Slowly we have initiated a Field of Customized micro Controller card replacement of PLC for Machine builders, Automation in manufacturing plant and new projects. 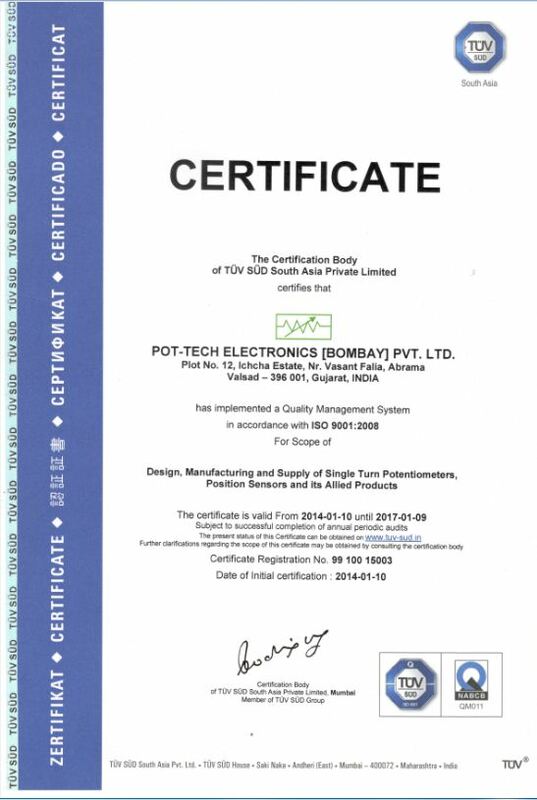 With this POT TECH ELECTRONICS has been a single destination for sensor selection and integration. We at POT-TECH Electronics have a theme line of Believe in serving. Serving the Industry through our products and hence the society is the professional way by which we stands on our theme. We fully support the Manpower of our company in there good and bad times and try to stand by their sides. This is our duty and hence the Social responsibility. Planted 86 mango trees in and around the Companies land adding our bit to Green Environment campaign. In Line with the same Our Company MD Mr. Mukesh Kinariwala serve in the Local old age home and add to the corporate social responsibility activities of the company.